As our 2014 “Paint the Industry Pink Tour” comes to a close, I look back with pride at what we have accomplished this past 5 years thanks to all of you – our dedicated community of supporters. We recognize the invaluable contribution of our sponsors, participants and volunteers whose dedication support and commitment help make TFAC one of the top community events on behalf of the CBCF Ontario Region. This year was a busy and exciting year for our Team Cure members and the TFAC Pinkie Truck, attending various trucking events throughout the summer, made possible through the generous support of our event sponsors Cervus Equipment Peterbilt Ontario and Highland Transport. 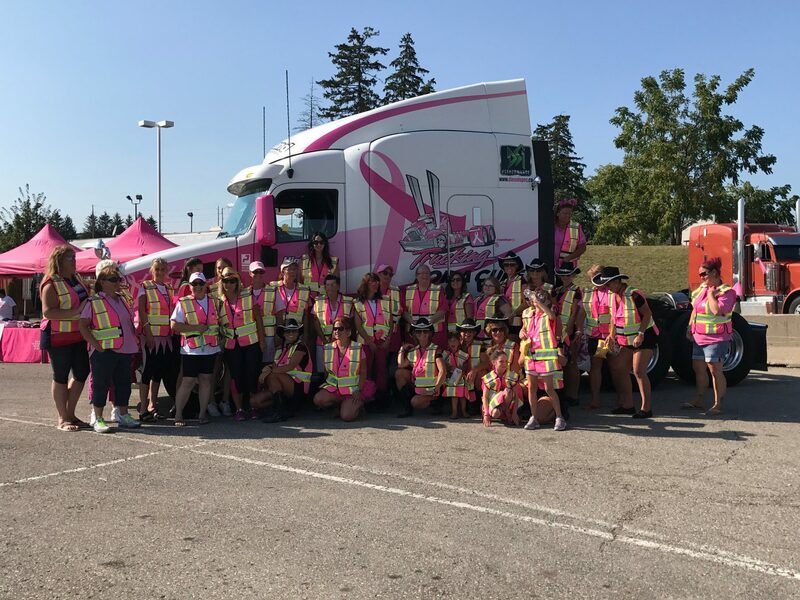 Also we saw Trucking for a Cure Prescott making their successful debut on Sept 6th with new sponsors Kriska Transport and Vitesse Transport and many more joining our fight against breast cancer. What a very warm and welcoming event this was for our drivers as spectators lined the streets waving and thanking them as they rolled through the City of Brockville and back to the Town of Prescott where festivities took place. Meritor Inc from Troy, Michigan moved into our Pink Ribbon sponsor level this year with their generous donation to the CBCF, this having their company logo now a part of the TFAC Pinkie Truck. Challenger Transport hosted their Truckers Olympics again this year at the Fergus Truck Show, with all funds raised going to the CBCF. The Big Rig Truck Nationals St Thomas Raceway Park was once again a huge success, owners Jay and Michelle Morse and their hard working staff put on another action packed weekend for the racers and fans. Jay and Michelle have been in partnership with TFAC since 2012 helping raise funds each year on behalf of the foundation. 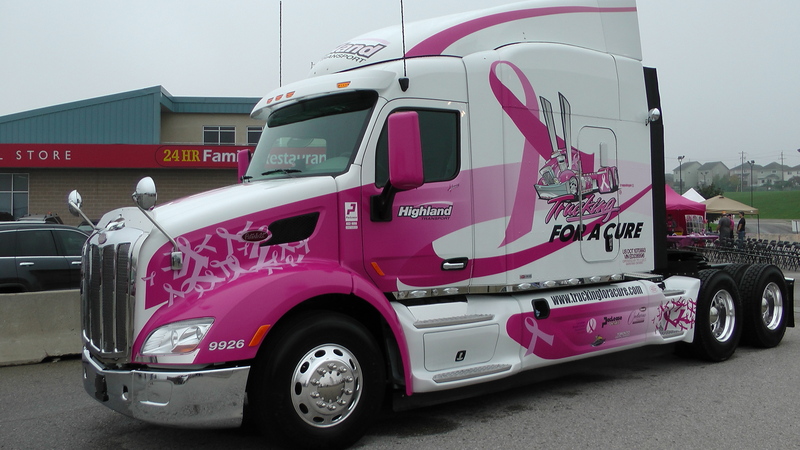 2014 has definitely been an amazing year for Trucking for a Cure; we thank all our returning and new sponsors for your generous support and donations towards the CBCF. To all our drivers and participants we thank you for being the heart and soul of this event, you are an inspiration to us all! And a special thank you to our dedicated volunteers for your support. You are all truly the backbone of TFAC and we are very proud of each and every one of you. Without you we would not be able to continue to be the driving force making a difference in the lives of so many. The Canadian Breast Cancer Foundation is committed to a vision of creating a future without breast cancer and together we can achieve it! Once again, thank you all for your support and we look forward to another successful year in 2015! Previous PostIst Annual Prescott Convoy a SuccessNext PostPrescott convoy photos now online!